There is a difference in quality cycling accessories . . . don't be fooled by imitations. The Bike Shack offers a vast selection of name brand accessories such as pumps, cables, pedals, handlebar grips and tape, tires, tubes, a huge selection of saddles and helmets, water bottles, cages, carriers, and much more. It's easy to improve your riding, head to toe with cycling essentials from The Bike Shack. You can upgrade to a lighter sleeker saddle, add new bar tape or grips with improved grip and cushioning, special brake pads for wet conditions, replace your tires, cables and housing or add a pair of gloves and shoes. Often, these are low cost upgrades, but they have BIG payoffs. Kids love riding in bike trailers. Parents love having their kids safe and secure when on rides. Bike Trailers make cycling with kids fun. Trailers are lightweight yet very sturdy, designed with plenty of head and leg-room, large viewing areas and plenty of ventilation. The areas largest selection of trailers can be found at The Bike Shack. With brands like Burley , Giant, and copilot, you can always find the style and price that fits your needs and budget. For the older child, we carry trailer bikes that allow kids to build their endurance while staying with Mom or Dad. Fit, feature and function for you... whatever type of riding you do. A snug, comfortable helmet is a key piece of cycling equipment. Our professionla staff will properly fit your helmet so you have maximum comfort and protection. Our goal is to have you wear your helmet on every ride and that means it has to feel great! With a large selection from Bell, Giro and Giant we are sure to have the perfect helmet for you. Click here to view a full selection of BELL helmets. One of the most popular and winning helmets on both the road and mountain bike circuits, the Sweep features Bell's top-of-the-line Twin Axis Gear (TAG) fit system. With 20 functional vents actively channeling airflow over the head and out the rear. It is easy to see why the Sweep is a favorite. Protect your eyes and face with a helmet visor and glasses. We carry a variety of styles from the full line of Serfas Eyeware. Performance footwear at it's best! Whether you are going out to get muddy on the single-track or going for a leasurely ride with the family, we have the shoes you need. The Bike Shack offers a wide selection of cycling shoes. We carry shoes for commuting, recreation and fitness riding. All of our shoes are made of the finest materials and constructed for long lasting wear and comfort. With brands like Pearl Izumi, Shimano and Giro we are certain to have the perfect shoes for you. Looking for handlebar bags, under seat bags, panniers or rear rack bags. Today The Bike Shack has a large and complete inventory to satisfy the needs of all of our customers. The under the seat wedge has a wrap around zipper provides easy access. Panniers have a large capacity main compartment featuring a covered zipper. 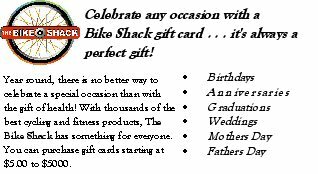 The Bike Shack offers the best brands and the best selection in the tri-state area. 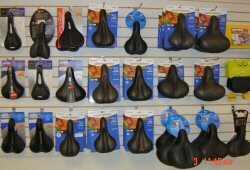 The Bike Shack carries a large assortment of bicycle seats to meet the needs of all cyclists. Today's selection of seats are for road, cross country mountain bike riders, commuters, touring cyclists and women. Variety of styles . . comfortable and lightweight. Some seats have softer covers, some have gel construction and are padded with three layers to distribute pressure in all direction. Updated models are available for women with new comfort technology and shapes. The key word is "comfortable" and our goal is to put you on the seat that best fits your needs and riding style. A secure bike carrier puts your mind at ease and keeps your bike safe for your cycling ventures. The Bike Shack has bike carriers to fit most vehicles from roof versions to tailgate types. Upgrades are available for most models. Hitch or roof Systems? Generally, roof racks are more easily expanded, as the tower-and-crossbar system provides the base for all attachments. But roof racks require you to lift large and sometimes cumbersome objects like bikes and kayaks overhead. Got a tall car? You might look into a hitch system. Check out the Yakima bike rack systems. Best of all . . . a bike carrier will save you needless worry and protect your bikes from damage. You'll be glad you made this purchase. Don't know what to buy? Try a gift card. Gift cards are available in amounts from $5.00 or more. Just e-mail info@thebikeshack.com and I'll get it sent to you. Surprise them with exactly what they wanted. Our gift cards are presented in an attractive glossy white carrier with envelop. Each gift card is issued in the denomination indicated by the purchaser. Come in, look around, and Ride with... THE BIKE SHACK! The Only place for all your Cycling and Fitness needs! ©The Bike Shack 2016. All Rights Reserved. Powered by Active-e.